Nathan with a solid Pere Marquette river Chinook salmon from a recent outing. 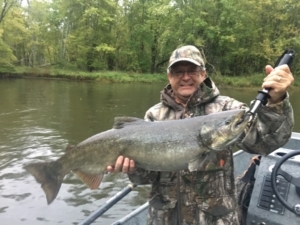 The Muskegon river fishing report for October 2, 2018 in the Newaygo, Michigan area is focused on the long awaited arrival of “fall” weather and the beginning of the annual fall Chinook salmon and steelhead runs. To read a short article on the fall Chinook salmon season on the Muskegon river, click HERE. With the long overdue arrival of more fall like weather, the Muskegon river is dropping in water temperature and we do have some salmon in the river now. Most of the salmon in the system now are “staging” in deeper pools and runs, but will be in search of spawning grounds soon. Fall steelhead will follow the salmon up the river and their numbers will increase as the salmon spawning activity picks up in a week or two, depending on river conditions. With both fly fishing and light spin tackle equipment, we’ll fish for some salmon up to the ladder part of October, but then it’s all fall steelhead from mid to late October until the close of 2018 and the arrival of the New Year. The Muskegon river has arguably the longest fall/early winter steelhead season of any river in the Midwest, with solid steelheading for nearly 3 months. This is due primarily to the rate at which river temperatures drop on the Muskegon river below Croton dam. With the arrival of some colder weather in recent days, river temperatures are finally coming down and the fall great lakes big game fishing season will be in full swing in another week or so. For current weather information and forecast, click HERE. Present water temperature is around 61-62 degrees. For current river temperature and water flow data, click HERE.